Aneurysm repair can be carried out either via open surgery or using a keyhole surgery (minimally invasive) technique known as Endovascular Aneurysm Repair, or 'EVAR'. EVAR involves using a long thin tube (a 'catheter') which is inserted into a small incision in the groin and manoeuvred up through the blood vessels to the location of the aneurysm in the abdominal section of the aorta. Dr Hagley then introduces special medical instruments and a 'stent graft' through the catheter, and the stent is positioned correctly in place with the assistance of special x-ray equipment (fluoroscopy). The stent is made of synthetic material encased in a metal 'skeleton'. Once in place the stent is expanded inside the affected section of the aorta and fixed in place with special metal hooks. Once the stent has been secured in place, the catheter is removed and the small incision is closed. The stent effectively provides a new tube through which the blood can flow, taking the pressure off the distended section of the artery wall and so limiting the possibility of a future rupture. The most common configuration is 3 pieces that lines the aorta from below the kidney arteries and bifurcates into both of the iliac arteries. The procedure takes around 2 hours and is generally conducted under a general anaesthetic. After the procedure, the patient may need to stay in a lying position for up to 4 hours to allow the insertion sites to start the healing process. The advantages of this keyhole technique are that there is no need for a large incision to the abdomen, the procedure is much quicker than open surgery and recovery times are much shorter, typically a hospital stay of 2-4 days (instead of 7+ days after open surgery). Standard EVAR covering the aneurysm from below the renal arteries into both iliac arteries. © 2017 W.L. Gore & Associates. used with permission. Dr Hagley has specialised training in complex endovascular aortic repairs. 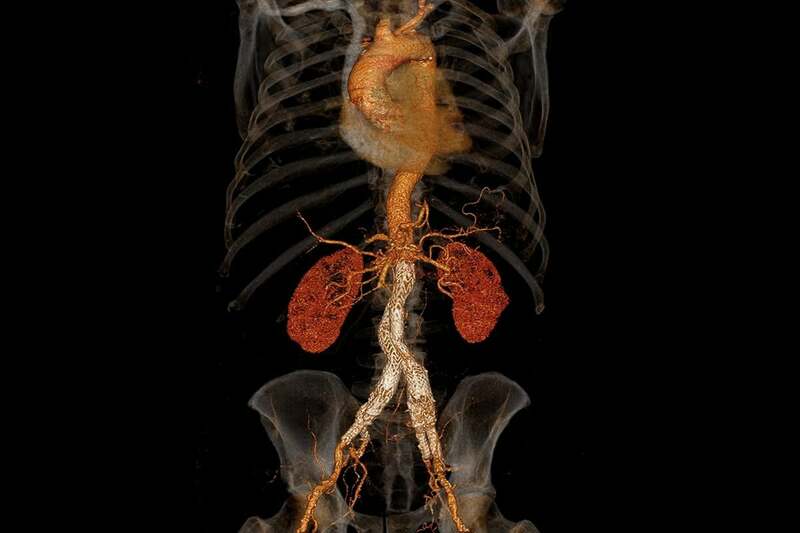 When the aneurysm extends further up the body than is usual, the aneurysmal section of the aorta can involve the segments that have branches that supply the kidneys and the bowels. In order to preserve flow to the kidney or bowel arteries, a specific stent graft can be tailor made to the patient’s anatomy. Extra stents are placed from the main graft into the arteries to the kidneys or bowel. This is based on a high-resolution CT scan and a graft plan devised by Dr Hagley. These procedures take longer to perform and have increased risks compared to standard operations. Dr Hagley will take time to discuss everything with you during your consultation. 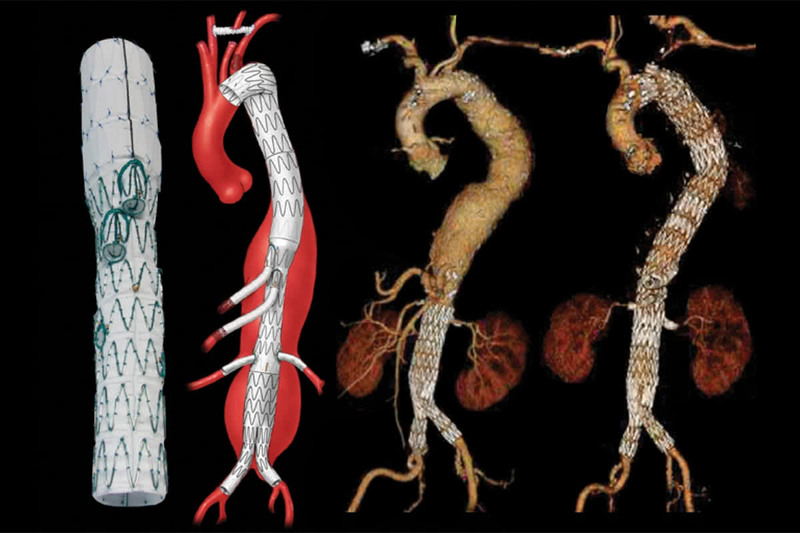 From left to right; 1 Photo of a graft with branches for the bowel arteries and fenestrations for the kidney arteries. 2 Schematic of the graft in place. 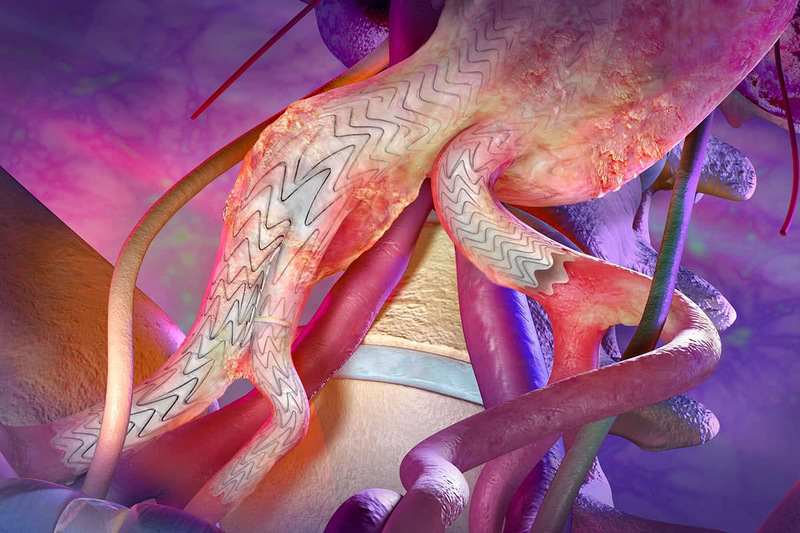 3 Patient had a previous standard graft repair, but developed new aneurysms within the chest. 4 Stent graft in place with branches to bowel and kidney arteries. © 2017 Cook Medical Inc. used with permission. 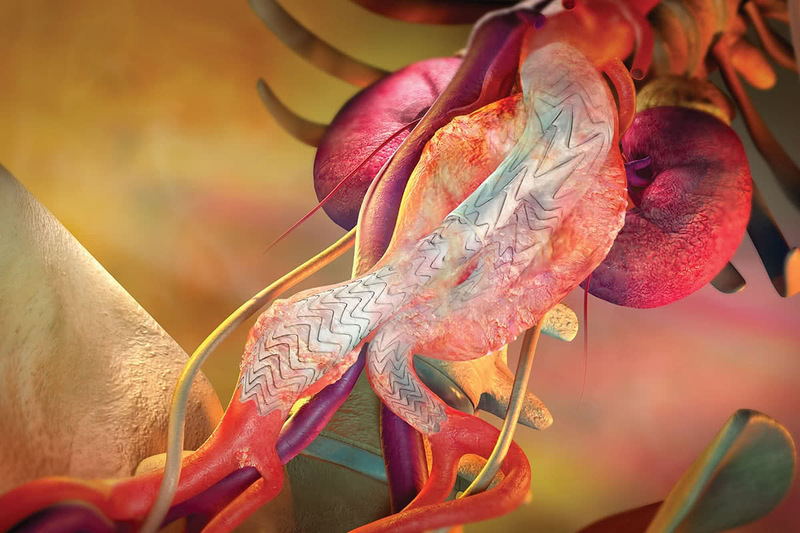 If the aneurysm extends into the iliac arteries, the standard approach has been to block off the smaller artery that supplies the pelvis and extend the stent graft down towards the groin arteries. This can lead to a lack of blood supply in the pelvis leading to pain in the buttock muscles, erectile dysfunction and spinal cord paralysis. Dr Hagley uses an advanced graft which has branches that supply both the pelvis and the leg arteries called an iliac branched device (IBD) or iliac branched endoprosthesis (IBE). Again, this procedure adds time and complexity to the procedure and Dr Hagley will discuss the risks and benefits of this with you. Distal portion of a graft showing a right sided branched endoprosthesis preserving flow into the pelvis. © 2017 W.L. Gore & Associates. used with permission. Post operative CT scan showing a standard graft and bilateral iliac branched endoprosthesis. © 2017 hagleyvascular.com.au.